The weather has flipped from random freezes to all-out 70 and even 80+ degrees here this week! Spring is certainly here in A-town alright, even if the calendars says it still has some more winter planned for us. I have two fashion ideas to share with you today, my (lady) friends. The best thing is that only TWO of these items are new to my wardrobe. The rest are pieces that I am repurposing in new ways. It's one of my favorite kinds of shopping: shopping your own closet! First: There is no reason jean-on-jean can't work. When you pair dark jeans (here, mine are actually jeggings) with a light chambray top, the effect is less 90's punk rock hangover and more fashionably on target for 2012. Break up the colors with a pair of shiny or colored heels. Jean is a neutral, after all! 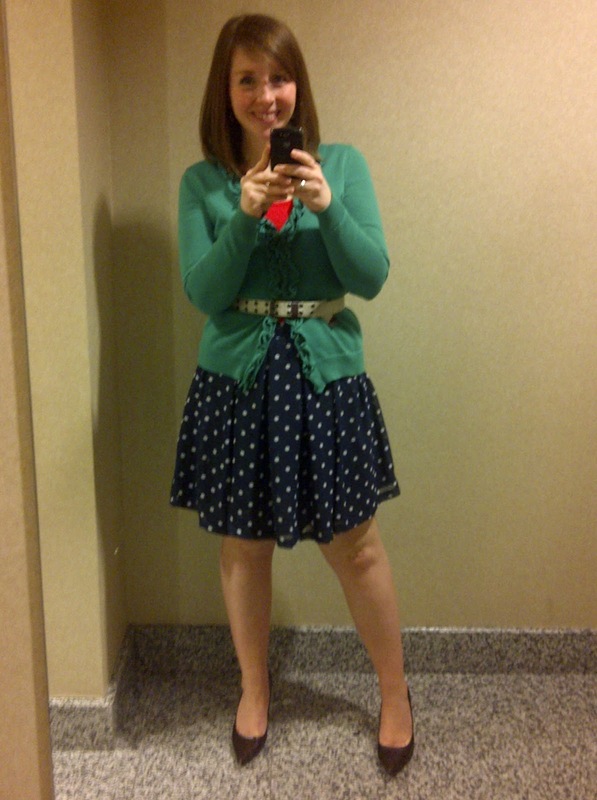 Second: Polka Dots and Bright Colors, oh my! Polka dots (and their sister-in-law, stripes) are all over the fashion map this spring. I had fun putting together this outfit of seemingly various colors and patterns, and voila, the polka dots actually become a base for the other colors to blend with. Layers are a must for us office-workers at this time of year, so I am getting some extra wear out of a cold-weather cardigan over a springtime tank. Tie things together with a neutral belt and heels, and your look will look bona fide JCrew-inspired. I hope this inspires you to shop your own closet as you layer up (and then down!) for this springy weather!